Amy! Thank you for making me laugh! I love that little bird. Too cute, Amy! Thanks for sharing and wishing you a great weekend! Christy: it is my pleasure!! Ms. K: I hope you have a great weekend also. 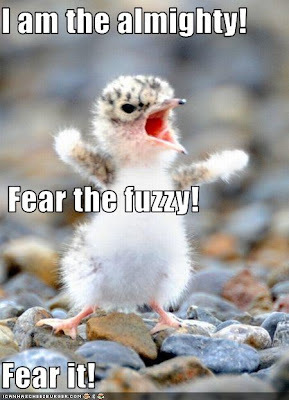 Hope no fuzzy's attack you! This is just totally adorable...thanks for sharing it Amy! I have to make this my desktop at work. Lord knows I need a laugh.